This is a sketch of a jumpsuit I designed for fall. Yes a jumpsuit haven't seen those since the seventies!! Well I've updated it, one suit dressing is not only warm and functional, but it gives the wearer a leaner, slimmer line. I've added military touches but still kept it classic in keeping with the philosophy of timelessness. 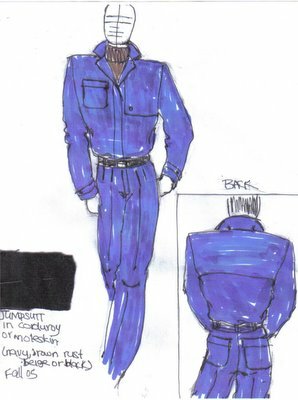 man i love your design..I myself am a big jumpsuit/coverall suit ... nice going keep up the excellent work ..kudos !! what do u think about men in full legged pants? smile?? I want some tailor made trousers coming to my neck of the woods anytime soon (we met on myway.com) . . .